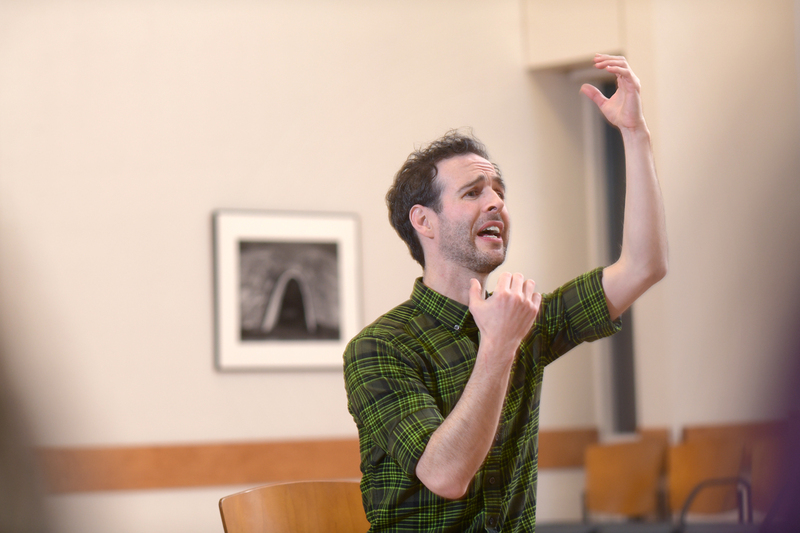 Michael Wood ’06 is a professional actor who can perform in three languages. He is fluent in French but also speaks Italian, so his voice is clearly very important to him. “However,” he said, “if I lost my voice tomorrow and couldn’t speak any language, I should still be able to tell a story." Wood recently visited the Bowdoin campus, where he conducted student workshops in French and Italian, as well as English. He also delivered a public talk, mostly in French, on physical theater, although he described it as more of a masterclass than a lecture. Physical theater is an art form Wood began studying seriously when he went to live in Paris after graduating from Bowdoin, having earned a double major in French and English combined with theater studies. “I studied at the École Jacques Lecoq, an international school that specializes in physical theater and where we learned about movement and mime. Not the Marcel Marceau, man-in-a-box-type mime, but mime as a tool for actors on stage, to help them connect with the audience.” Paris was already familiar ground for Wood, who spent his junior year studying abroad there. He has returned on several occasions over the years, for two or three months at a time.